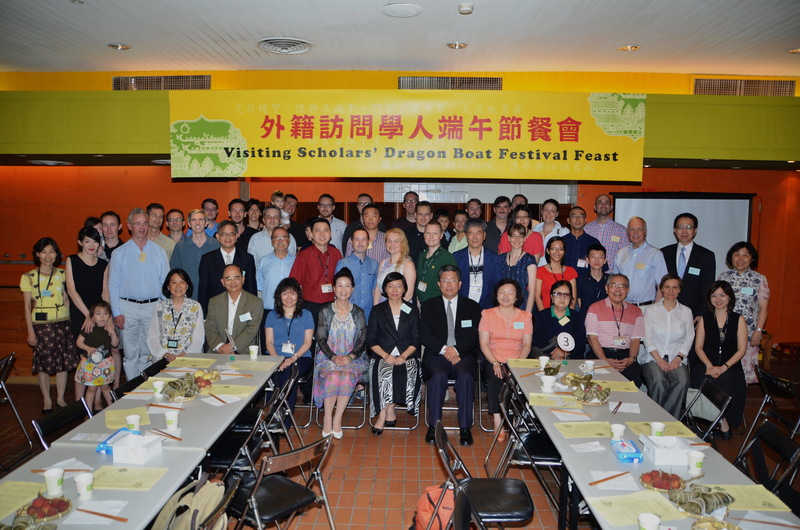 The Dragon Boat Festival Feast co-hosted by the National Central Library of Taiwan is held on June 10, 2015. Scholars from 20 different countries and some of their families, along with staffs from National Central Library Taiwan (NCL) and Ministry of Foreign Affairs Taiwan (MOFA), jointly about 80 attendees, participated in this special event. Both the Director-General of NCL Ms. Shu-Hsien Tseng and the Deputy Director General, Department of Policy Planning, MOFA Mr. Vincent Liu addressed their welcoming remarks, and opened the prelude to this year’s Dragon Boat Festival celebration. Her Excellency Iris Chou, (Minister, Dept. of Policy Planning, MOFA), and two international scholars, Dr. Brigid Vance of Lawrence University, U.S.A. and Mr. Tatsuo Araki of University of Tokyo, Japan, performed and shared their wonderful talent skills during the feast for entertainment. This day, our friends from all over the world enjoy their joyful time, and share the unforgettable experiences together.